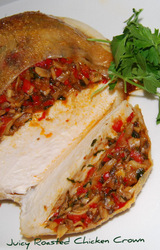 This is a double roasted chicken breast or crown recipe. The crown being the two breasts together with the main bone still in. 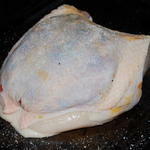 It's a great way to cook chicken because when you cook a whole bird there's aways the problem of the breasts cooking before the legs are ready, and so ending up with either a dry breast or an uncooked leg. 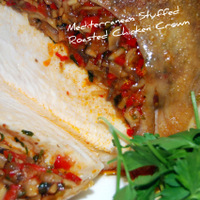 The Mediterranean stuffing goes perfectly with the crispy skin and moist tender meat. 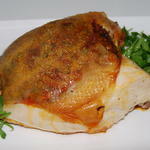 Also, by placing the stuffing under the skin you get a self basting bird that needs no attention at all. 1 Good sized chicken crown - about 1kilo/2.2lbs bone in and skin on - ask your butcher. 1 Lemon cut in half. 1/2 A medium onion -finely chopped. 1/2 a red bell pepper - finely chopped. Half a dozen good sized mushrooms chopped. A little tomato puré to bind. A small bunch of fresh coriander - chopped. Really simple - place all your stuffing ingredients minus the tomato puré in pan with about a tbls. of good quality olive oil. Cook on a medium heat until all is soft and cooked through - about 15 minutes. Take it out of the pan and leave it somewhere to cool. Meanwhile - starting at the back - squeeze your hand under the skin and loosen as much as possible while leaving the ends attached. 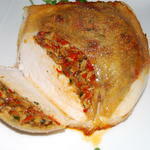 Now spoon the cooled stuffing into the cavity - see pic 1. above. Now place it in a medium oven 180ºc/350ºf for 30 - 40 minutes until cooked through. 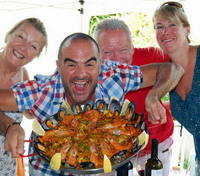 And That's it - Serve with the lemon halves.